Key concepts • 3 GPP = Project that aims to develop GSM and UMTS specifications in cooperation with the vendors, operators and standardisation organisations. The acronym 3 GPP stands for Third Generation Partnership Project. • Fault management = Functions that enable the detection and location of failures in the network and scheduling of repairs. 3 GPP specifies the requirements of the concept. 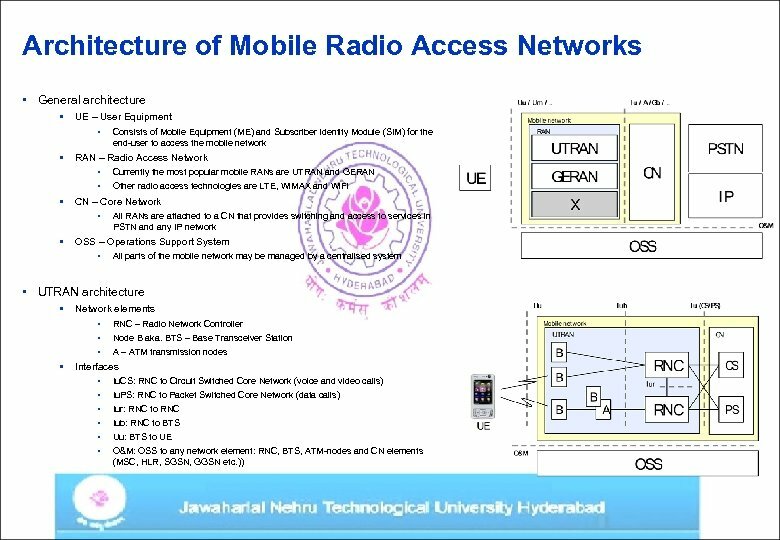 • Mobile radio access network = a network that provides wireless access to users through radio interface and allows the mobile users to move between coverage areas without losing connection, i. e. handover. • Performance management = Functions that enable the performance measurements of network services. 3 GPP specifies the requirements of the concept. Results (I/IX): Current PM and FM organisation and process • Organisation-wise Technical support is the communicator between the local customer contact teams and product line R&D organisation. 1. 2. Technical support investigates and analyses the performance degradations and makes decisions to fix them with the co-operation of R&D. 3. • Local teams communicate the performance status of the customer networks to the technical support. R&D’s responsibility is to develop corrections to the system, if no other solution is effective. The process follows the three phases of the root-cause analysis methodology: • • Analysis (maps to FM [3 GPP]) • • Investigation (maps to PM [3 GPP]) Decision (maps to SWM and CM [3 GPP]) Each phase of the process has deliverables that are utilised in the later phases. 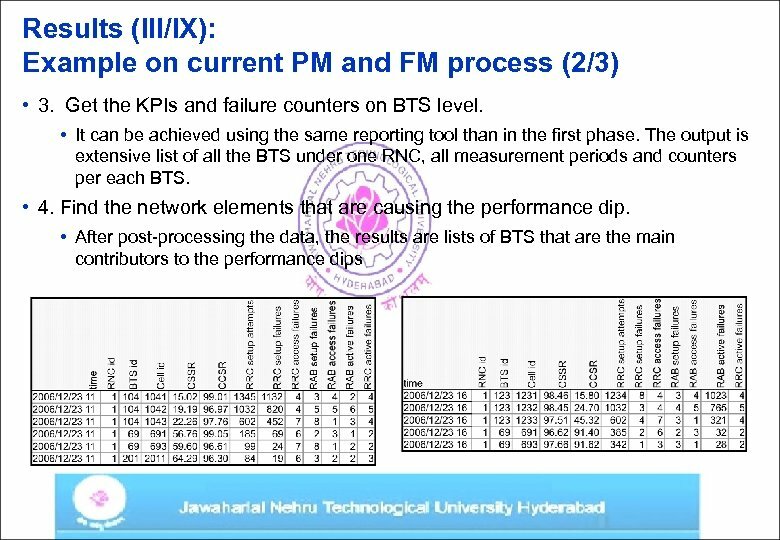 Results (IV/IX): Example on current PM and FM process (3/3) 5. Gather the system logs for those network elements that are main contributors of the RNC performance dip. • Achieved by connecting to the network element’s O&M unit either by manual command procedures or using a tool that automates the procedure. The log files are usually in binary format, so they need to be opened by a parser or converted to textual format before the analysis can take place. 6. Analyse the detailed data. • The format of the data is vendor specific, i. e. not defined in public specifications => no general guidance can be set for the analysis itself. • Highly dependant on the individual system specialists that can handle the versatile analysis and can produce reliable results The analysis can be in this context treated as a black box, which has the input of system data, i. e. logs, parameters, alarms, counters and KPIs, and output of set of root-causes for the occurred performance problem. • 7. Generate a solution to the root-cause. • Needs the presence of a skilled system specialist. Depending on the type of solution, finding a working solution might need trial and error approach. • Before applying the solution to a live network, it is tested in a test bed of the vendor. Some network operators have also test beds of their own, on which they verify the solutions, e. g. SW corrections, before they are installed to the live network. 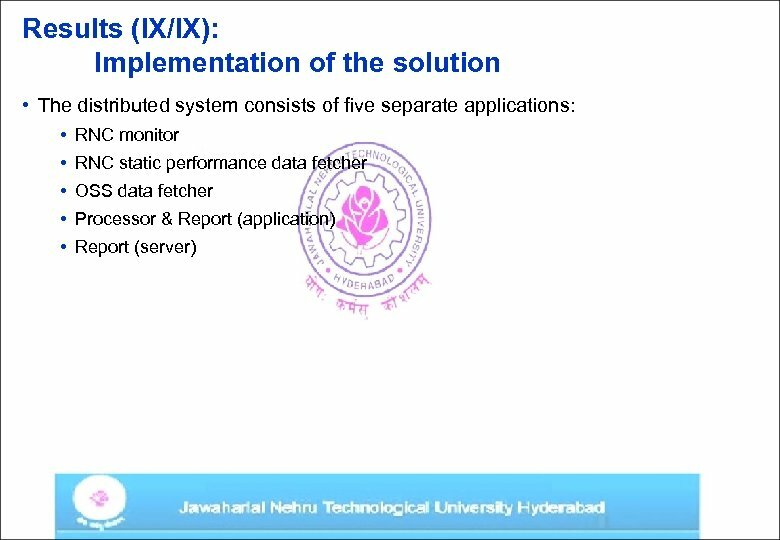 Results (VII/IX): Summary of the analysis • Analysis set two general requirements for the solution: • Support fault management analysis conducted by system specialists. The solution should be able to collect relevant fault management (FM) data, i. e. NE logs, configuration data and alarms, for troubleshooting. 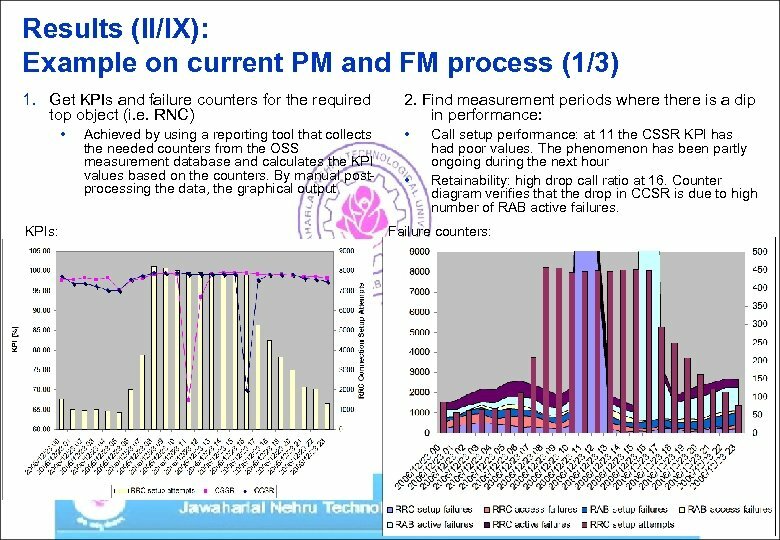 The evaluation of the FM data relevance bases on the performance measurement data, which may be collected either from OSS or from RNC. • Support general reporting of performance conducted by operator and vendor performance management bodies. The solution should produce scalable reports of the performance measurement data. Reports should represent the performance data both on whole network and individual network element level down to the level of a single cell. Other statistical requirements are: timely aggregation and that the data can be averaged. 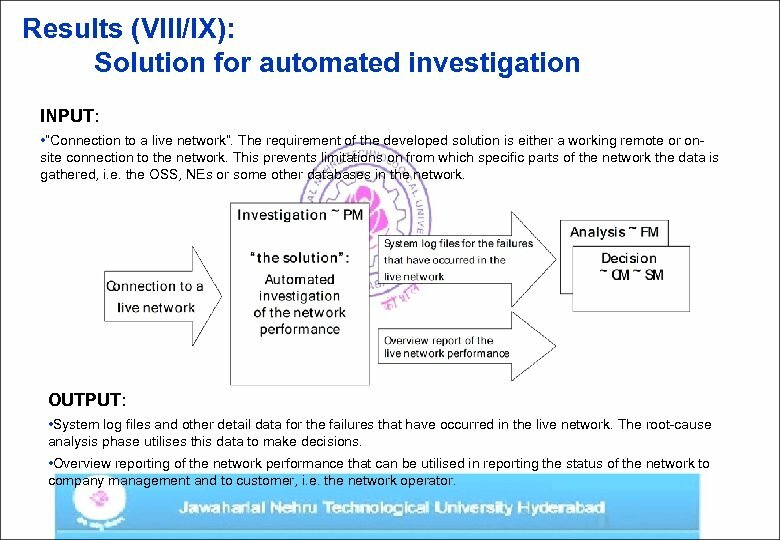 Results (VIII/IX): Solution for automated investigation INPUT: • “Connection to a live network”. The requirement of the developed solution is either a working remote or onsite connection to the network. This prevents limitations on from which specific parts of the network the data is gathered, i. e. the OSS, NEs or some other databases in the network. OUTPUT: • System log files and other detail data for the failures that have occurred in the live network. The root-cause analysis phase utilises this data to make decisions. • Overview reporting of the network performance that can be utilised in reporting the status of the network to company management and to customer, i. e. the network operator. Conclusions of thesis • Summary of thesis, Thesis studied practical problems of mobile radio network management: • Conclusion: UTRAN vendor technical support requires a distributed system of troubleshooting tools to enhance its troubleshooting processes • • Purpose of the troubleshooting tools is to enhance the performance investigation by automating gathering of the performance and other relevant network behaviour data for the time periods where network suffers from low performance The reasoning of the solution bases on • Current troubleshooting set-up study: • • • The analysis of the current set-up: • • currently the main problem is the inefficiency of the first, i. e. investigation, phase in the performance and fault management process. 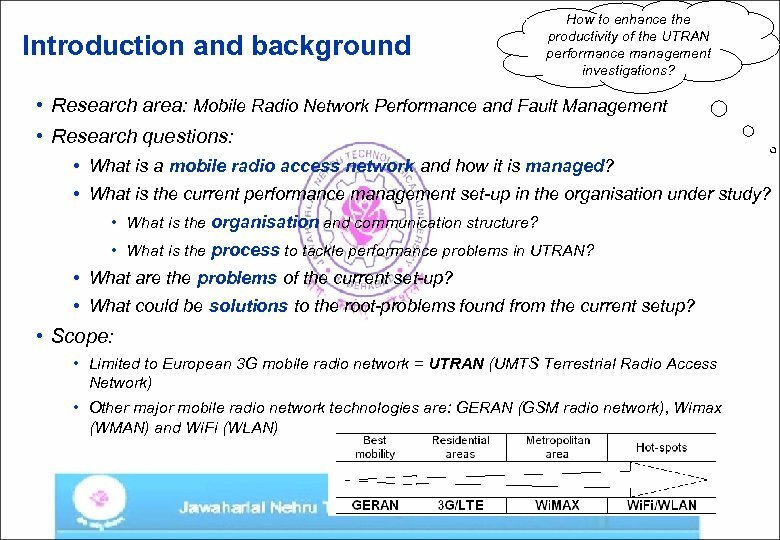 Generalisation of the results • Same principles are applicable to other radio network (e. g. GERAN) performance and fault management • Utilization of an OSS in data gathering makes the solution more portable to other radio network systems • • Organisation: vendor home base technical support that is a link between local teams, which are located by the operated networks, and the vendor R&D. During special occasions, e. g. a new product release or emergency situation in network, the organisation may adjust itself by transferring temporarily system specialist to work locally by the operated network. Process: The practical performance and fault management process consists of three phases: investigation, analysis and decision. Typically OSS uses relational SQL databases. Different radio networks have different performance indicators. Then the same tools may be used after modifying SQL-queries, which is a straightforward process Future work • • Scope was limited to investigation. Also the complex analysis-phase has demanding development needs. Technical support organization requires product-processes to manage the development and maintanance of the troubleshooting tools. References • Standards and Technical Specifications • 3 GPP: GSM, 3 G and LTE • IEEE: Wi. Fi and Wi. 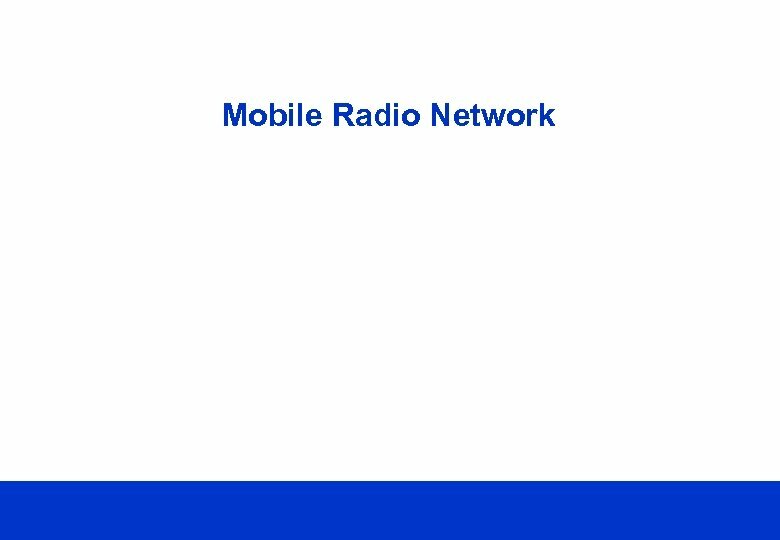 MAX • Commercial material • Nokia Multiradio: http: //www. nokia. com/NOKIA_COM_1/Microsites/Nokia. World/Press/Multiradio_Press_Backgrounder. pdf • Cisco Wi. MAX: http: //www. cisco. com/en/US/netsol/ns 616/networking_solutions_customer_profile 0900 aecd 80334 a 23. html • Previous thesis’ • Kujala, Kimmo (2006) Expert System for Mobile Network Troubleshooting. Thesis. Diplomityö, TKK / Sähkö- ja tietoliikennetekniikan osasto, 2006. 72 p. • An attempt to build automated fault analysis tool system. The result in thesis was that automated analysis is still unreliable! • Utriainen, Juha (2004) UTRAN Operation System Security. Thesis. Diplomityö, TKK / Sähkö- ja tietoliikennetekniikan osasto, 2004. 64 p. • Gives a good overview on the UTRAN O&M (Operation and Maintenance) • Handbooks • Kaaranen, Heikki (2005) UMTS Networks – Architecture, Mobility and Services. Second Edition. JOHN WILEY & SONS. ISBN: 0470011033 • Nielsen, Jakob (1993) Usability Engineering. Boston: Academic Press, 1993.